Where can you find great Sunday school activities for all ages? Do you have a hard time finding Sunday school activities for younger and older kids? Did you know that there's a comprehensive resource available on the web? Not only that, did you know that this resource has an incredible selection and variety to choose from? So what is this resource? 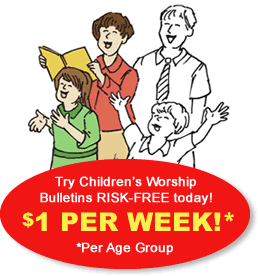 Children's Worship Bulletins are 4-panel bulletins for children created from familiar Old Testament stories and lessons from the Epistles and for nearly every Gospel theme. The bulletins are available for two age groups: ages 3-6 and ages 7-12. They are theologically sound and tested in the classroom. There are so many things you can do with Children's Worship Bulletins! Whether you simply print them each week to follow the Lectionary or choose to print a specific Scripture or topic, you'll find that each bulletin contains great activities for all ages. In this short article, we've provided just two examples of Sunday school lessons about Gideon that you can use with Children's Worship Bulletins in your next Sunday school class. Give the children a bulletin and a pencil. Have them complete the "Gideon believed. He built an altar ... " puzzle. Lead the children in this activity. First, have them repeat in unison, "The Lord is peace." Then, explain that they're going to replace the word "The" in the sentence with two claps of their hands. Repeat the sentence, using the code for "The." It should sound like, <Clap> <Clap> "Lord is peace." Next, explain that they're going to replace the word "Lord" by raising both arms in the air and yelling, "Wooo!" Repeat the sentence, using both the codes for "The" and "Lord." It should sound like, <Clap> <Clap> <Wooo!> "is peace." Next, replace "is" with three stomps of their feet. Repeat the sentence. It should sound like, <Clap> <Clap> <Wooo!> <Stomp> <Stomp> <Stomp> "peace." Next, replace "peace" by putting their hands on their hips and whispering "peaccccccce," emphasizing or holding the "s" sound at the end of the word. Repeat the sentence, using all the codes. It should sound like, <Clap> <Clap> <Wooo!> <Stomp> <Stomp> <Stomp> <peacccccccce>. Finally, say the entire sentence without the codes, "The Lord is peace," followed by the sentence in code, <Clap> <Clap> <Wooo!> <Stomp> <Stomp> <Stomp> <peacccccccce>. Repeat the two sentences three times. Sunday school activity about Gideon for ages 7-12: What happened next? Distribute a bulletin to each child. Write the verse on the board. Have the children repeat the verse in unison by pointing to each word written on the board. Erase two random words from the verse. Have the class repeat the verse. Again, point to each word written on the board. At the blank spaces of the erased words, pause for a moment, so that the children say the missing word from memory. Erase two more random words. Have the class repeat the verse — this time saying the four missing words from memory. Continue erasing words and repeating the verse until all of the words are gone and the children are reciting it from memory. Write the verse on the board again, and ask the children to read it. Point to each word. Erase the verse completely and ask the children to say it from memory. If necessary, tap on the board for each word of the verse. Explain to the children that they can use this same technique to memorize other verses of Scripture. Erase one or two words at a time, each time repeating the entire verse until they have it memorized. The above activities are just two examples of Sunday school activities about Gideon. Our library contains thousands of bulletins, themes and Scripture passages. Each bulletin is designed so that children can learn the important truths for today from the many relevant messages throughout the Bible. We continue to add new content from the Old Testament, the Gospels and the Epistles that bring Scripture to life in fun, new ways. All bulletins come with answer keys. Many bulletins are in color. There are even bulletins for special holidays!